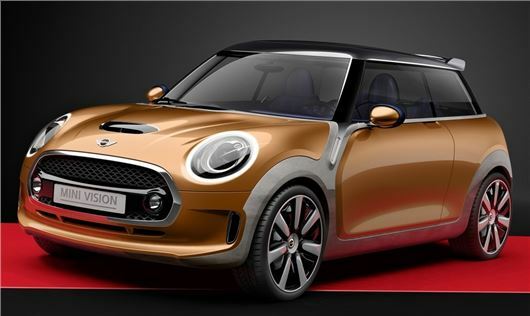 MINI has unveiled the MINI Vision which shows what the all-new MINI hatchback, due to be launched early next year, will look like. Unusually the Vision isn't a physical concept car, instead it's only a digital model, but it's enough to give us a very good idea of the look of the new car. What's not surprising is that MINI hasn't broken the mould with the look of the new MINI. It's pretty much a gentle evolution of the current car with the trademark MINI shape and those familiar design traits like the upright black windscreen pillars, round headlights and the scoop on the bonnet for more powerful models. There are some changes though - the headlights are now circled by an LED ring for daytime running lights, although these are likely to be only on higher spec model. At the back the tail lights now cut into the boot like the Paceman, although thankfully it's better looking. Economy should be better thanks to improvements in aerodynamics includes an integral air channelling roof spoiler. The concept car is finished in a colour called Glamorous Gold, a shimmering gold-tinged orange that's new to MINI. Inside, the Vision builds on the design of the current MINI but the concept car has a more minimal design including a 'floating' centre console. There are new features like fabric straps on the doors (arranged like the stripes of the Union Jack flag) to make using the door pockets easier. As with all concept cars there are some leftfield features too like the MINI Disco floor which uses different coloured lights in the footwells. It's part of the Driving Experience Control switch, which sounds grander than it is. This lets you choose different modes for the lighting in the cabin and changes the face of the big central instrument display so you can have a classic analogue look or a 3D appearance.